Compounding the Golden Liquor (jinye). Chinese alchemy is based on doctrinal principles, first expounded in the founding texts of Taoism, concerning the relation between the Dao and the "ten thousand things" (wanwu). Its teachings and practices focus on the idea of the Elixir, usually called Golden Elixir (jindan), Reverted Elixir (huandan), or simply Medicine (yao). The root-meaning of the term dan (elixir) is "essence"; it connotes the reality, principle, or true nature of an entity, or its most basic and significant element or property. Alchemy intends to illustrate the nature of this authentic principle. In the practices, compounding the Elixir has two primary meanings. In the first meaning, the Elixir is obtained by heating its ingredients in a crucible. This practice, as well as the branch of alchemy that is associated with it, is known as Waidan, or External Alchemy (lit., "external elixir"). In the second sense, the ingredients of the Elixir are the primary components of the cosmos and the human being, and the whole process takes place within the person. This second form of practice, as well as the corresponding branch of the alchemical tradition, is known as Neidan, or Internal Alchemy (lit., "internal elixir"). 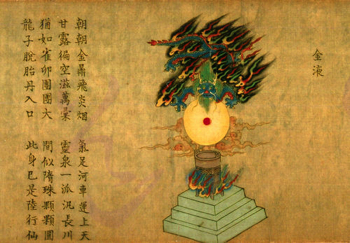 Historical and literary sources (including poetry) provide many relevant details, but the main repository of Chinese alchemical sources is the Taoist Canon (Daozang), the largest collection of Taoist works. About one fifth of its 1,500 texts are closely related to the various alchemical traditions that developed until the 15th century, when the Canon was compiled and printed. Later Neidan texts are found in the Daozang jiyao (Essentials of the Taoist Canon, compiled around 1800 and expanded in 1906). Many others have been published in smaller collections or as independent works. The first allusions to alchemy in China date from the 2nd century BCE. However, the combination of doctrines and practices involving the compounding of an elixir  which is necessary to distinguish alchemy from proto-chemistry  is not clearly attested until the 3rd century CE. The first identifiable tradition, known as ☞ Taiqing (Great Clarity), developed from that time in Jiangnan, the region south of the lower Yangzi River that was also crucial for the history of Taoism as a whole. The main extant source of this tradition is the ☞ Book of the Nine Elixirs (Huangdi jiuding shendan jing). Important details on the early stages of Taoist alchemy are also found in some parts of the Baopu zi neipian, written by Ge Hong around 320 CE. Its descriptions of processes that can be compared with extant sources are, however, often abridged and sometimes inaccurate. The Taiqing scriptures contain descriptions of methods for making elixirs and of benefits gained from their performance. [See a ☞ selection of Taiqing methods.] On the other hand, they say virtually nothing about their doctrinal foundations. However, the emphasis given to certain aspects of the practice, and the terminology used in those descriptions, show that the central act of the alchemical process consists in causing matter to revert to its state of "essence" (jing), or prima materia. The main role in this task is played by the crucible, whose function is to provide a medium equivalent to the inchoate state (hundun) prior to the formation of the cosmos. In that medium, under the action of fire, the ingredients of the elixir are transmuted and "revert" (huan) to their original state. The commentary to one of the Taiqing scriptures equates this refined matter with the "essence" issued from the Dao that, as stated in the ☞ Daode jing (Book of the Way and its Virtue), gives birth to the world of multiplicity: "Indistinct! Vague! But within it there is something. Dark! Obscure! But within it there is an essence." When he ingests the Medicines, let him fly as an immortal, have audience at the Purple Palace, live an unending life, and become an accomplished man! (1) The first main method is based on mercury and lead, which respectively represent the Yin and Yang principles. These two substances are refined and joined in a compound that is deemed to embody the qualities of Pure Yang (chunyang), that is, the state of Oneness before its division into Yin and Yang. (2) The second main method is centered on cinnabar (Yang). The mercury contained within cinnabar (representing the True Yin contained within Yang) is extracted and newly added to sulphur (Yang). This process, typically performed nine times, finally yields an elixir embodying the luminous qualities of Pure Yang. This Yang is not the complementary opposite of Yin, but, again, represents the Unity before its separation into the two complementary principles. During the Tang dynasty (7th-9th centuries), the Waidan tradition reached one of its peaks with Chen Shaowei (early 8th century), whose work describes the preparation of an elixir obtained by refining cinnabar. Among other representative texts of this period are several collections of recipes, of which one of the most important was compiled by Sun Simo. The first half of the Tang dynasty also marked the climax of contacts between China and the Arabic world. These exchanges may be at the origin of the European mediaeval word alchymia, one of whose suggested etymologies is from middle Chinese kiem-yak (the approximate pronunciation of present-day jinye, or "Golden Liquor") with the addition of the Arabic prefix al-.